Tuesday's vote in Westminster on the draft withdrawal agreement will again go against Theresa May's government - and a chaotic and unplanned UK crash-out from the European Union at the end of March comes another week closer. It can be avoided by accepting the agreement as it stands, the best deal Theresa May's negotiators could secure since the EU has ruled out material changes. The alternative avoidance manoeuvre is a climbdown and positive action by the UK to defer Brexit. Crash-out is the do-nothing outcome and cannot be prevented through motions to the contrary in the House of Commons. The Taoiseach has urged the UK to accept the agreement as drafted, since it avoids a hard border and preserves the Good Friday Agreement. A success for Mrs May in reversing the large Commons majority against the plan would be greeted as a deliverance in Ireland. But the withdrawal agreement and the accompanying 'political declaration' map out a course for the UK which is opposed by many MPs for reasons which have nothing to do with the Northern Ireland backstop. They believe the plan will result in a fractious and economically costly stand-off between the UK and Europe, not the soft Brexit, or no Brexit, which they prefer. Mrs May needs to convert at least 115 MPs to overturn the 230-vote loss last time round, and only about half that number, the DUP and the ultra-Brexiteers, would be persuaded by a further fudge, should that prove possible, on the backstop. There is no sign of an adequate fudge forthcoming from the EU-27 at this point. 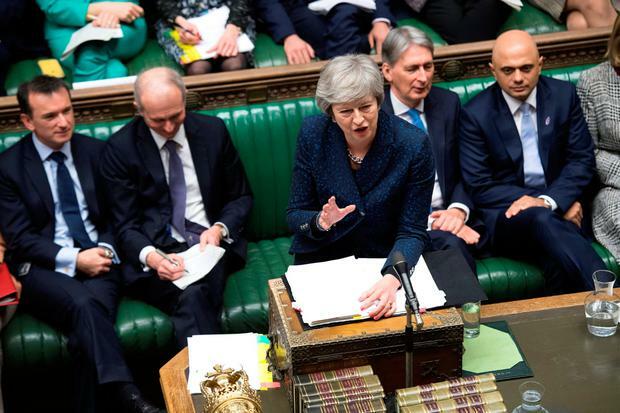 The UK government may lose more narrowly on Tuesday, but it's a long way from the 202 votes in favour last time to the 315, or even a few more without abstentions, that would be required. Without a withdrawal agreement, the UK crashes out of the European Union eight weeks from next Friday. That means not just an immediate hard border in Ireland but also between the UK and its European neighbours. The land border in Ireland will, for the UK economy, be the least of its problems. Even for the Republic, the re-imposition, in chaotic circumstances, of barriers to east-west trade would do more economic damage than the purely economic cost of a land border with Northern Ireland - the opposition to which is driven, understandably, by security and political concerns. The Central Bank of Ireland released a report last Friday which helps explain the Irish Government's concern to avoid a crash-out Brexit. Paschal Donohoe's expenditure plans assume that the economy will continue its recent strong performance over the next few years. The Bank believes that economic growth could be cut severely, perhaps close to zero, if there is no Brexit deal, and hence no transition period. That could mean an emergency budget and reduced expenditure plans, current and capital, unless you fancy a run of budget deficits, rising debt ratios and trouble in the bond market. The Central Bank's analysis includes a sterling depreciation and accords with earlier studies by economists in the UK and elsewhere, which calculate that the negative impact of the various Brexit scenarios will be greater in Ireland than in any other EU-27 country. Mrs May's deal is truly a terrible deal for the UK. It will provide short-term relief followed quickly by a resumption of war between soft and hard Brexit proponents. If it somehow goes through, UK officials will have to engage in difficult trade negotiations with the whole wide world from outside the EU as another cliff-edge looms, in every way a crisis deferred. The MPs who oppose the withdrawal agreement for reasons other than the backstop have serious UK long-term interests at heart and they may yet prevail. Moderate Tory and Labour MPs, in alliance with the Scottish Nationalists and Liberal Democrats, are seeking to assemble a Commons majority for a route to deferring Brexit, possibly involving a second referendum. Irish politicians from the Taoiseach down would be happy to see a deferral of Brexit, particularly on a basis which could yield a soft Brexit or none. To indicate such a preference, however, looks like an intervention in the UK's internal politics - espousing the withdrawal agreement, signed off by the EU-27 and supported by Mrs May, is not vulnerable to the 'mind your own business' reaction. Even to announce extensive preparations to mitigate crash-out chaos fuels the Brexiteer argument that no deal equals no problem: the Irish authorities have an incentive to prepare for crash-out while understating the level of preparedness. The UK government, led by David Cameron into the 2016 referendum, made no preparations for a Leave verdict, even instructing civil servants to ditch contingency planning. The Leave campaign also avoided, as a deliberate strategy, any detailed plan for extracting the UK from its 45-year involvement in European integration, knowing that there were too many conflicting versions of 'Leave'. The spin-the-bottle referendum yielded a narrow win for an outcome for which no serious preparation had been made by politicians on either side, Leave or Remain - an astonishing dereliction of duty to which the historians will hardly be kind. Mrs May's deal reflects her aversion to freedom of movement and consequent inability to retain access for the UK's services sector to the EU's single market. Britain has greater strength in services businesses, and a trade surplus with Europe. Last week Ivan Rogers, the senior official who resigned in exasperation at the May strategy early in 2017, delivered another of his periodic broadsides. Rogers focused on the political declaration which accompanies the withdrawal agreement and argued that it delivers the respite of a transition period until end-2020 only at the cost of a hard Brexit. The trade negotiations will be a nightmare for the UK with the dice loaded decisively in favour of the EU-27. The recent objections from British industry have been to a crash-out Brexit - manufacturing will be damaged less severely in an orderly Brexit, but the services export businesses will suffer far more. Services markets in Europe are largely closed to third countries. It is the single market rather than the long-established customs union which opened the European market to British services firms in sectors like finance, law, consulting, media and entertainment. Rogers believes that these sectors are being sold down the river. A deferral of Brexit for a few months, which is possible under the Article 50 process if the EU-27 agree, would probably achieve very little without a change in the UK government's strategy. Mrs May has drawn too many red lines to permit an agreement any better for the UK than what is on offer. Short of a decision by parliament to resubmit the decision to the electorate in a fresh referendum or another general election, the last resort could yet be a unilateral revocation of the UK's resignation from the EU. In December, the European Court decided, to the surprise of some legal experts, that a departing member state has a unilateral entitlement to withdraw its Article 50 notification without losing any pre-existing privileges, resuming full membership and free to quit once again at some future date. This get-out-of-jail-free card could yet be the one to play.